Real Madrid produced a remarkable performance at the home of the European Champions to progress to the final. Pep Guardiola named a more adventurous team than in the first leg, playing Thomas Muller at the top of the midfield, with the knock-on effect that Philipp Lahm was moved to right-back. Carlo Ancelotti made only one change – Gareth Bale was fit to start on the right, so Angel Di Maria swapped sides and Isco dropped out. This game was over before half-time, with Real’s gameplan working brilliantly. Possession play against counter-attack, then, although a slightly confusing game in terms of identity – because it’s the German side playing pure possession football, and the Spanish side showcasing reactive play. The style was similar to the first leg, albeit more extreme. That isn’t to say that Bayern were more concentrated on possession play – indeed, they started this match by moving the ball forward quicker, and the use of Muller (rather than a third midfielder in that role) meant they had more players high up the pitch, in goalscoring positions. But, in a way, that was what made it more extreme – Bayern had another player higher up the pitch, and this allowed Real opportunities to counter-attack through Bayern’s side easily. And while the possession play was less cautious, this meant Bayern’s moves broke down more, they conceded possession more, and Real could break more. With Bale in the side, Real had an extra counter-attacking weapon – and never before has their counter-attacking play been so devastating against a top side. Bayern’s passing started very quick, with Franck Ribery and Arjen Robben fed whenever possible, and both were allowed to carry the ball forward at speed – something that rarely happened in the first leg. Muller offered another option upfront – he made some good runs into the channels while Mario Mandzukic stayed in central positions, and overall there was certainly more variety to Bayern’s attacks. The lack of penetration remained, however, but the greater problem was that Bayern were very poor at defensive transitions. At Barcelona, Guardiola’s players were excellent at pressing as soon as they lost possession, partly because they covered space so evenly, and therefore prevented the opposition from bursting into an obvious gap on the break. These concepts are much less obvious in this Bayern side – here, Real had time to knock an intelligent first ball out of defence, and their attacking players were allowed to receive the ball in pockets of space, free from any opposition pressure. Rather than excessively criticise Bayern’s bluntness, though, it’s worth outlining what an extraordinary defensive effort this has been from Real Madrid – keeping two clean sheets against a Bayern side packed with genuine attacking superstars. Real’s main weakness in recent seasons, especially against ball players, has been the tendency of Sergio Ramos and Pepe to be drawn out of the backline, leaving gaps in the defence and diving into rash tackles. Ramos made one rather risky challenge near the corner flag considering he was a booking away from missing the final, but neither player was ever tempted up the pitch to close down Muller or Mandzukic between the lines. That was primarily because Real minimised the space there so well, which is remarkable considering they’re using two pure technicians in the midfield zone, combined with two wide players who naturally want to attack. On paper, Luka Modric and Xabi Alonso can surely only work together with a holding midfielder behind, or perhaps an energetic, powerful shuttler alongside. No – instead Ancelotti has managed to make them extremely disciplined, and the midfield quartet as a whole played extremely deep throughout this game, conceding space in front, but denying any between the lines. Neither Modric nor Alonso are natural tacklers – the latter would have been better off remembering that, considering he’ll now miss the final after collecting an unnecessary booking – but their positional play is excellent, and obvious bonus is that when they win the ball, they distribute it brilliantly into attack. Real didn’t go ahead through counter-attacking, though, they went ahead through two set-pieces – both headed in by Ramos. The value of going ahead early when playing a counter-attacking gameplan has been outlined repeatedly by Liverpool this season – most obviously against Everton and Arsenal – because it draws the opposition onto you in a bid to fight back, and leaves space to attack into. If the opposition are reluctant to concede space for you to break into (which wasn’t necessarily the case here) being excellent at set-pieces is very useful. The goals themselves, though, were just about good delivery and poor marking. In fact, it’s interesting that Bayern lost this game 4-0 in the exact way they won last year’s semi-final against Barcelona 4-0 – where set-piece power proved crucial. Then, of course, there were the counter-attacks. Bayern’s main problem was that Real were leaving two men up the pitch, something Bayern have struggled against throughout the knockout stage – from Mesut Ozil moving forward to join Yaya Sanogo and break through the defence in the opening stages at the Emirates, to Danny Welbeck moving upfront ahead of Wayne Rooney in the quarter-final. But Real boast players of a better quality, and in particular the world’s best counter-attacker. This was reminiscent of Ronaldo’s performance for Portugal against Sweden late last year – able to stay high up the pitch, break two-on-two along with a selfless central striker, and put the game beyond the opposition. He was joined by both Di Maria and Bale on the break, too, with Di Maria overlapping well in the early stages (reminiscent of Fabio Coentrao’s movement for the only goal of the first leg) and Bale providing similar qualities to Ronaldo from the opposite side, from a deeper role. The Bayern centre-backs played high up the pitch, forcing Manuel Neuer to continually sweep up behind – and he was tempted into two mistakes when a long way out of his box, presenting both Bale and Ronaldo with an open goal from long-range, although neither found the target. Real’s interplay for their third goal – Benzema, to Bale, to Ronaldo – was brilliantly selfless, and a perfect example of counter-attacking ruthlessness. It was now 0-3, which ended the contest – Bayern now needed five goals. Guardiola made changes to get back into the game, although his half-time change was removing his centre-forward for holding midfielder Javi Martinez – a sign the defence needed protection, and a rare example of damage limitation from a proudly attack-minded manager. This is one of the most shocking results in recent European Cup history – the reigning champions being battered 4-0 on their own ground. The manner of the victory was plainly obvious – Real went ahead through set-pieces, then counter-attacked, overcoming Bayern’s technical quality with physical power and pace. It’s something this Bayern side was never vulnerable to last season, however. It arguably qualifies as the most impressive victory of Ancelotti’s distinguished career. Bale and Ronaldo will get the praise, but there’s no great managerial skill in getting those players to counter-attack speedily – Ancelotti’s greater achievement is making the Alonso-Modric combination work defensively. Guardiola’s philosophy doesn’t require a complete re-think, but he probably needs to put his stamp upon the side in terms of personnel. With Thiago injured and Mario Gotze only on the bench, this XI was basically Jupp Heynckes’ side playing football that doesn’t entirely suit their strengths – last season they mixed possession football with more direct attacking when required. Aside from a promising opening here, Bayern were simply too slow with their passing and lack the individual magic or the cohesive passing and movement to unlock defences. This individual result doesn’t signify the death of tiki-taka, but as part of a wider picture it’s clear that possession football has become less celebrated, less widespread, and less dominant. But not necessarily less effective – as ever, that depends upon the implementation of the approach, rather than whether it’s being used. what gaurdiola’s team wants is a team effort and unfortunately last night he was not able to get it from his team . i am sorry but i dont agree with your observation . you seem to have gladly forgotten the lack of effort from schweinsteiger . to be honest let me tell you for the first 20 min i was finding it hard to find him on the pitch and his role in the team . now cross was orchestrating the play . ribery and robben were wingers and muller was behind manzukic . now let me tell you about the barca system or gaurdiola’s system . in his system the defense starts from top . neither ribery nor robben seemed very interested in defending . muller was suppose to press on one of the back four or alonso but i am sorry to say that the mentality still is the same . they go and stand up and look for action rather than pressing and taking initiative . in the match you could see alonso was never pressed and was able to pass the ball with ease or receive under no pressure at all from any players . what was scweine role in the team he was suppose to be the man behind muller and manzukic but he was too slow and stupid . he was even slow on defense and didnt do his work of pressing either of the real midfielders . now if real can pass the ball out of defense with out any pressure in midfield and the midfield has got freedom then how the hell do you seem to play a high line with bale , di maria and ronaldo in the side . it is hopeless . in your post you had systematically blamed on gaurdiola but never tried to question the players especially german’s as what he expects out of the system . now i had watched ribery but never found him laughing and most importantly he always losses his temper whenever he is up against a good opponent . i really dont know as to why schweine started the match instead it would had been better to start with martinez . i think one thing that bayern got wrong is that they hurried too much . the barca side under would test oppositions patience without the ball by just passing around and then opening defense when they sense a lack of concentration or effort . i forgot to mention but why wasnt kross given the freedom to move up the pitch and dictate the play . he has a good eye for pass . plus he has a good shot from distance which has proved to be lethal at times . most importantly he is technically good like gotze who should had come earlier instead of muller . when the world was watching how bad bastian was then why didnt he remove him in first half itself . gaurdiola should had shown the courage to do that when they were one down and bastian was ineffective . he should had removed muller for gotze instead of manzukic who is good in the air and even can play with his back to the goal . now another that i forgot the real midfielders were quite away from their back four and had somebody dropped in that space for bayern and picked the ball then it would had been better . atleast real would had been on back foot and alonso and modric would not had come that far up the pitch . muller and manzukic were just playing the same role somebody needed to be in that space . i said after the man utd 1st leg..Bayern are a tad over-rated. Mandzukic & Muller are good players but not greats..not in same class as Suarez, Aguero etc. and let me repeat..Ribery & Robben are both 30+ & fading.. even Andy Townsend made apoint i agree with…re Riberys lack of end product / goals… just 1 goal in last yr’s UCL http://www.free-elements.com/Europe/Goals/Ger/euBaym12.html . really glad he didn’t get euro player of yr.
. i agree with ZM Alcantara & Goetze had to play their parts if Bayern were to retain it. nobody else has done so , so don’t quite see why wider media giving Pep so much stick. Neuer is a top keeper , but i felt he wasn’t on the greatest form last night..the shot by Ronaldo looked saveable, and was it the 1st by Ramos also went very close to him. i’m not a big fan of Modric but the counter attacking style..seemed to suit him… he’s likes to carry the ball, and then slide a pass in..from a deeper position. he frustrates me playing further upfield…like Silva…doesn’t shoot /score much. & never had a great assist stats. I’m not fan of Real, but that Alonso foul was no yellow card, just a simple foul. The Dante card however could of been a straight red from a ref that gave the first so easily. I’m no Real fan, but I am a fan of Carlo Ancelotti. I never understood why Chelsea sacked him. He’ll never get the lavish praise of a Mou or Pep b/c he doesn’t say stupid or divisive things in the press or have an exotic “philosophy” and look good in designer jeans, but he deserves to be mentioned anytime the great managers are brought up. Good for him. It’s really difficult to draw strong conclusions about this match because of the two early set piece goals to the counterattacking side. However, given the first match and a modicum of evidence from this match, I think we can safely say that Real’s counterattacking side is marginally stronger than this Bayern side. I say marginally because I still think that had Bayern scored first, Madrid would have been finished. They would have no way of coming back. I think the main reason for Bayern’s decline is of course their attempt to play a pretty game instead of playing the pragmatic German game that fits them well. I never liked the Pep Bayern experiment because it was emblematic of the fast-paced globalization/homogenization of football, which for me is sterilizing and removes character from world football. The more homogenization is slowed down, the better. Let the Germans play their high lines, attack without pause and shoot from long range. Let the Latins cheer nutmegs louder than goals. Etc. As for the ramifications on possession football… It seems Barca has shortened our memories. Every since Brazil’s defeats in the 80’s, defensive counter-attacking has been the norm in football. The only team I can remember since which wanted to really boss the ball was Valderama’s Colombia. Barca was a bit of a miracle – a combination of the perfect players, the perfect attitude, and a Spain-wide movement to possession-based football. It was magic, a magic that a single coach cannot parachute anywhere he wants. I hope Pep abandons his experiment and returns home or somewhere closer to home, perhaps to a small club, and creates some magic. Not a fan of any of the teams, but Bayern did not deserve to lose with that margin. I really do not like it when matches are decided by set pieces, rather than flowing football. Bayern do need to find a way to play Martinez, Kroos, Muller, Gotze and Roben if they want to remain strong. It is time to bench Ribery and Schweini, although I am a big fan of the former. And additionally… either buy new defenders or drop them deeper. I do hope Real gets this season title as they seem as the most exciting team in the league. I wonder whether you had the same thought process last year when Bayern destroyed Barca 4-0 with set pieces being key? The thing is Barca were destroyed. I did not feel that Bayern were destroyed here. More like a class from Real Madrid to be so effective and getting the most of the set pieces. The thing is you can’t put defenders deeper when you’re playing possession football – defenders need to press high preventing any counter BEFORE the counter actually happens, that’s the whole point + to win the ball back fast when you loose it. So pep is in trouble: the defenders he has can’t seem to do that the way the Pique/Puyol duo used to do, they don’t have the positional awareness to do that…and that was obvious even against Manu and Arsenal (to an extent)…in a few words he has to buy or suffer a lot of counters! It was the exact same like 2013 with Barca. 2 Setpieces were all Real needed. To me it was clear, that if Real take the lead “the thing is over” because Bayern would never ever have been able to score 3 against this defense. A thing to consider is, that Bayern dont have the individual potential Barca has. They lack players like Iniesta and Messi. Pep should acknoledge this and stop trying to “cope Barca”. Bayern has “physicality” and a “true 9″ hence they looked as powerless as Barca in the copa and the 2nd leg against Atleti. Coincidence? This is really interesting because its possession against counterattacking. Possession does need nothing but the ball, but counterattacking depends on possession to be executed. Its the easier way of playing. I really dont see a crisis of tiki taka, because like last year its always a game of margins. Barcelona ie really were impressive this season against City and Real 2 times, but they need to improve certain points, not the whole picture! 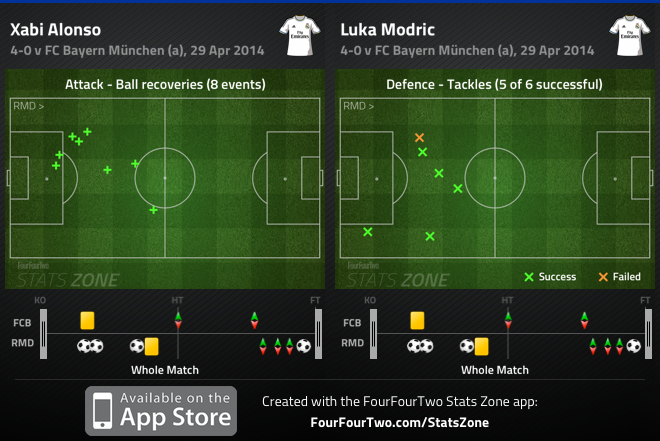 great analysis, bayern really didn’t look like they wanted to win the game, their lack of pressing showed that. the real question is why martinez failed to start both matches ? How come you neglected the form Bayern is in in domestic league? Bayern needed to take more shots from distance. That would have drawn out defenders a little more. Also, stop using inverted wingers if the opposition is clogging the middle. Low crosses would also have been better to balls that Pepe and Ramos could reach consistently. Modric-Alonso were great but Bale-DiMaria were just as good. They helped out and cutoff space for some of the best wide men in the game. Bale also showed his incredible ability to explode on a run that very few players can do (Ox, Messi?). The issue – raised by someone else above – of how we rate Ancelotti’s career, is an interesting one. He is never mentioned in lists of the great managerial innovators of the last fifteen years, but if you think about it, he has consistently won with idiosyncratic formations and approaches – idiosyncratic in the sense that he has always worked to stuff as many creative central midfield players in as possible in a decade when athleticism/defensive positioning has been more and more valued in that role. Think the Milan Christmas tree with Pirlo, Seedorf, Kaka and Rui Costa all in the team (!! ), and now this remarkable Modric-Alonso-Di Maria combination, with no “natural” holders at all. Being a Mourinho (tactical) convert I would never have thought this latest move possible, but I’m delighted to be proved wrong! Incidentally, it seems at least partially to explain why he tends to get on with the megalomaniac owners of big rich clubs: they tend to want unrealistically attacking line-ups, and he is probably unique among the top managers in being able to offer that, while guaranteeing a good level of success (unlike, say, Villas-Boas [so far]). To be fair to him, Rogers looks to be beginning to achieve something similar with his diamond, which on paper looks hugely fragile (Gerrard as sitter!) but in practise has been mostly brilliant. In that sense this season’s Liverpool and Real Madrid teams are not too tactically dissimilar, in that they both play “attacking counter-attacking” (if that makes sense). Ancelotti vs Guardiola — The pragmatist vs the ideologue. Ancelotti is the pragmatist — Not known for any specific style or system, but constantly adapting his approach to his current team, just like any good manager should. Guardiola is the ideologue — Famed for his innovative system, and attempting to indoctrinate the teams he manages wholly into that approach. Mourinho is an amusing combination of the two, so committed to pragmatism that it has become his ideology, regardless of the talent available to him. Well said! I think the main thing that holds Ancelotti back in those conversations is that with all the great talent, and innovative play during his tenure at AC Milan 2001-2009, he only won 1 scudetto. That’s a very interesting comparison with Liverpool. Many managers attempt to use such tactics, some even successfully, but not many have been able to make it work at a wealthy club against top competition. Rogers has been able to do it consistently this year, but Ancelotti is the only manager I can think of that has done it basically everywhere he’s been. Even in Pep’s Barcelona days Busquets was used as a pure holder (albeit a non-traditional one). this discussion about tiki taka versus counter attacking is interesting when people don’t whine about it. i really like to watch possession based teams play (i play football and, like guardiola, i HATE losing the ball, especially misplacing a pass). but everywhere i see the discussion the only thing claim is that possession sides must find alternatives, change a few things, be updated, adpated, etc. but the problem, which no one seems to have an answer to, is what would be the solution? counterattacking football has been taking advantage of possession increasingly often. it is a big problem for a team who likes to pass their way into opposition box to have 9, 10 men, between them and the goal. what can they do to solve that? maybe tiki taka sides should pass the ball around in deeper areas to see if they can draw opposition? or start shooting from long range? a lot of people talk about alternatives, but there doesn’t seem to be a clear one. long shots will stop or deflect from one of the many bodies inside the box. passing the ball around the back will only make the reactive side more reactive. maybe one way would be to only adopt a possession based style after you have the lead, or playing different styles in different games (i mean, completely different, not adopting your style to the opponent). maybe the next step in the tactical evolution is be flexible instead of specialized in one type of gameplay. In my view, there’s always been possession and counterattack — they’re just two sides of the same coin. Tiki taka is just possession in the extreme. Eschewing risky passes that might lead to goals in favor of keeping the ball, and then pressing immediately to win it back as soon as possession is lost. Diversifying the attack seems to be the primary means of advancing tiki taka forward — keeping the ball but attacking from different angles and areas, sprinkling in some crosses and quick counters and becoming less predictable. And ultimately encouraging your opponent to come out and play by allowing them some possession so that you in turn have some room to attack as well. After Bayern demolished my beloved Barca last year I too came to the logical conclusion that the next step is flexibility, and I thought this Bayern were the team to deliver that. Most of the players in the squad are tall and technically gifted, and were descibed as(I did not and still do not watch a lot of their games)masters of possession. I remember the press speculating whether Bayern would try to take on Barca on their own possession game, which they did not even attempt. They killed them with counterattacks and set pieces. Contrary to most of the sensatonalistic media, I’m not one to lay judgment based on one two or a few games. But Bayern showed yesterday that they most certainly do not master tiki-taka, not against the top teams anyway. Although, one should keep in mind that this Real Madrid we’re seeing now, has been moulded over the last four years to kill exactly the kind of beast they were facing. A beast which has had about a seasons practise in the game plan they tried to execute yesterday. It wasn’t until Tito Vilanovas reign before RMA was able to beat Barcelona multiple times in a season. People seem to forget just about how dominated Moudrid was by Guardiolas Barcelona, they couldn’t even win on their own turf. Flexibility can also be called “jack of all trades master of none” which means highly specialized counterattacking or possession teams may most certainly outplay them. The question I’m asking myself NOW is: What could football possibly evolve to? Are we stuck in this endless cycle of cycles? Your question makes me sad. 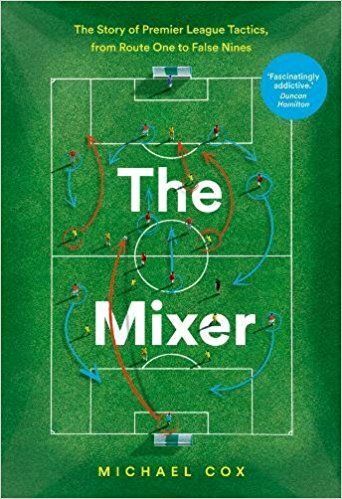 The most important thing, as detailed by JB, is to establish a difference between regular possession based football and tiki-taka; and the main problem with tiki-taka is that it is an extreme. Heynckes’ Bayern was the second team with the most possession in last year’s Champions League, but tactically, that Bayern was always ready to lose the ball, retreat and then exploit any spaces, as soon as they recovered the ball. Another example of possession based football that rejects the stiffness of the tiki-taka, is the football played by Japan’s national teams, both women and men, at all categories (u17, u20, etc.) Since the japanese players tend to be smaller and physically slim, to avoid brawling for the ball, and therefore losing it, they opt for possession. However they are demanded to constantly shot from outside the box, and dribbling on 1-on-1 situations are encouraged, even if that leads to the loss of the ball; not to mention that tactically they position themselves for long balls, from deep positions, that leave a player high on the pitch with a lot of free space. 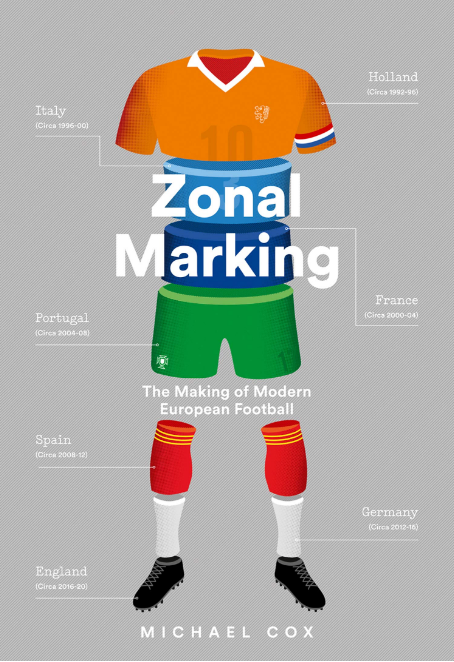 It is very discouraging though, the simplistic evaluation of all “pundits.” They take, either tiki-taka or bus parking, as the reference to conclude what’s best and what’s outdated, despite both styles being extreme, and inherently, unbalanced. It is pretty daft, all this reactionary babbling. What should we make of the football of Dortmund and Italy’s national team, then? Both very balanced and attractive. What Guardiola needs, is someone that tells him “you are wrong.” I’ve got the feeling he only has “yes men” around him; and what Bayern needs, is a competitive league. They should restrict themselves from poaching talent from the same league, or at least, from their main rivals. Waiting for the knockout rounds of the Champions League to detect the real strengths and weaknesses of the team, is just not going to work out for them. Theoretically, Sammer is that man. He was basically hired to say bad things about the players and criticize curing the Heynckes era. Unfortunately he’s been rather quiet under Pep. Well yes. Football has been and probably always will be, cyclical in nature. Of course a manager should have a philosophy, but they should also be able to adapt and change that philosophy when it’s clear that the football landscape has changed. Ancelotti realised this many seasons ago. I still think that Pep’s philosophy is extremely effective but he failed to realise that he didn’t quite have the players to carry it out. On another day with better set piece defending, the result could have been different. It is awesome to see ZM back with his best work here. Lately I’d given to directly going to Guardian or ESPNfc for a more comprehensive analysis by ZM (something i did for this match too). But it is sincerely brilliant to see the most complete work here. Thanks ZM for trying to keep the soul of this wonderful website. That said, wonderful analysis as usual. But the last para was the best for me. Possession is being trumped by counter attack right now in european football. Its no coincidence that 3 of the 4 CL semi finalists are compact counter attacking sides. It’ll be interesting to see if the trend continues at the world cup. Last year’s confederations has already given us a clue that the world has started adjusting to possession based tiki taka. Here though, Guardiola was done in by the monster he created. Its his barca side that has forced Real into becoming this ruthlessly efficient counter attacking monster and with all the classico’s in the past 5 years, this Bayern probably felt pretty easy to Real. Barca’s struggles after Pep has shown the world how important his role was in shaping the world class talent at Barcelona into the all conquering team they became. But this match shows us, how important players like Xavi, Iniesta, Busquets, Messi, Alves etc were in putting Pep’s ideas into practice. It is becoming increasingly clear now (as if it wasn’t yet) that Pep’s barca was a perfect mixture. Great point about the special chemistry, & synergy that Guardiola enjoyed at Barcelona. His decision to join Bayern Munich is bizarre, because surely there is more pressure on him there, in a foreign country, with a language barrier! In a footballing sense, Bayern’s European expectations are just as high as Barcelona, even though they play in an inferior domestic league, as evidenced this season by the Bundesliga being secured in record time. The chasm that exists between Bayern & the rest of German football is getting bigger for the foreseeable future. Could Guardiola make a return to Barcelona? He could still be like Ferguson @ Man U, and Dalglish @ Liverpool. Bayern didn’t seem like they were prepared for the personnel or tactics of Real. Obviously the 2 set-piece goals threw a wrench into their gameplan, but it sure seemed like they were confused by Real having 2 deep lying playmakers in midfield. This combined with just how many pure attacking players Ancelotti fielded made Bayern unsure of how to execute. It appeared that Bayern were looking to close down the ‘playmaker’ in midfield quickly so the counter-attacks couldn’t happen so effectively, or at least had to start with the ‘holder’ in midfield, and since they didn’t know which one to target, it just didn’t happen. This is most likely what made Schweinsteiger and some others appear to be sluggish in their play. Ancelotti threw a curveball and the opposition just wasn’t prepared. His comments earlier in the week heralding ‘catenaccio’ and how it resulted in many positive results, followed by his plan of attack was just brilliant! He was always winning this kind of matches by wrong red cards, penalties which were dived by his divers in Barcelona or gifted by referees. For example the famous corner penalties against AC Milan or a red card for RVP. Just prove me I am wrong he won the first CL trophy because of Ovrebo and the second one because referees always saved him when he was loosing and he needed a goal but the opponents defence was working, so there came glorious red cards for Pepe, not allowed goals like Higuains one, red cards for AC Milan and Arsenal and of course the famous penalties after dives. Without dived red cards and penalties and strange decisions he would have won nothing in CL, just like with Bayern. Ronaldo got fouled yesterday and what. A pathetic yellow card, just imagine Messi in his place LOL. A red card in a second! The talk out there in some of the media about the “death of tiki-taka” is way overblown and simplistic. Pep had a very tough conundrum to death with when it came to matching up personnel – he did not have on the pitch that one player in the deep mf role that is needed for this system to really work. That is why the continuing need for Lahm in that position, which is his best option there but in the first leg left him vulnerable in defense at RB and unable to an overlap with Robben. So facing Ronaldo and Bale at the same time, he had to bring Lahm back to right back, but now had no one to fill the deep-lying (I.e. “Busquets” or “Guardiola” if you will) role in the center. A midfield trio of Schweinsteiger, Kroos and Muller just wasn’t going to cut it and really limited, in my opinion, the impact Kroos can have on the game. Meanwhile, Real’s gameplay was perfectly suited to the personnel Ancelotti could put on the pitch, and they were of course superior on the set pieces which was the X factor. Should Pep have adapted to what he had and compromise the initiative? I don’t think he is wired that way. I would say that the Robben/Ribeiry inverted winger thing is getting way too predictable and easy to defend with a team the caliber of Madrid. It becomes dribble/dribble/dribble while everyone else stands around and watches. I also thought Mandzukic was essentially invisible in both legs – I don’t know whether that is due to him or to what was not happening around him. Bayern’s problem for me is that they need to either find a top quality right back who can take Lahm’s place and allow him to move into the midfield, or they need to find that player that provides what Busquets always provided for Barcelona and thus keep Lahm at RB where he can do his thing. That is the linchpin decision that makes everything else go – it would allow Pep to use players like Kroos and Gotze where they are most effective, in the way that Iniesta and Xavi did for Barca. If they can’t do either, then they can’t play the way Pep wants to play when facing top opponents in the CL. Kudos to Ancelotti, he has some dangerous weapons at his disposal and he has shown he knows how to make the most of them. I was most impressed by the defense of Real. The four goals in Bayern’s home were impressive no doubt –how could they not be? But not allowing Bayern to score in 2 legs? Not only that, but the only time Bayern had a chance (very few and far inbetween) was due purely to luck. Gotze’s chance in the first leg comes to mind. Bayern had ZERO chances when they incisively broke down Madrid. In fact, I don’t even remember them penetrating Madrid’s defense with a thought out attack, any times (very few) when they did penetrate, it was due to chance or luck. That’s why they couldn’t do it regularly. I was overly impressed by Real’s defense. Especially when taking into consideration that their biggest weakness has been their backline. The difference between this year and last year is not Bale. It’s Carvajal instead of Arbeloa, Coentrao instead of Marcelo and most importantly Modric. Of course the CBs have played well as well, but it’s due to these other three in my opinion. Bayern has been losing games in the league against much weaker side after they won the league. The overall enthusiasm of the team has dropped since winning the league and it is very hard to find it back in a week against one of the best team in the world. That said, Guardiola has 90% to blame for this loss. Tactics aside, he is unable to keep the team motivated after winning the league, and he included Rafinha (whom 99% of Bayern fans would have disagreed with him) for the first leg and find himself having to name a more adventurous side for the return leg. If Martinez had started, Ramos would not have been able to head in the first two goals. It’s not entirely tiki-taka versus counterattack. Teams in general now have be able to play possession better than before because the press has become stronger so all teams need to retain possession at some point The counterattack has to be more precise and faster – hit and hope balls are not good enough. The traditional long ball to the wing, cross and header seems to be less effective. Defences have to be much more structured and disciplined. It’s becoming more like basketball or handball – everyone can control the ball – basic control and pass errors are reduced, fast breaks are good scoring opportunities but require speed and precision, but then main play is finding a route through a block defence which requires much smarter movement and management of space. As more teams step up to the extra skills required, it will be interesting to see how the game evolves. Excellent analysis! Real Madrid were clearly the better team over two legs, they were more hungry for victory, a side that is much more organized than the three times they have failed to qualify for the final under Mourinho. A mention and credit is due to Zidane, although he is an assistant coach and loves flying under the radar without any media attention, he has been a key man under the gaffer. His main job has been to purely study opposition teams scoring strategy, hence why they did not concede any goals against last year’s champions, he also works one vs one with players passing his experience to them, an injection of confidence. The locker room is more united and there is a higher trust with these players. As for Bayern and Guardiola, it just wasn’t meant to be, perhaps if they were matched against Chelsea or Atletico Madrid, the outcome would have been better. Bayern were outclassed over 180 minutes. As for all the comments about tiki-taka and whatnot, this is why teams need to be able to play different styles, professional football players at this level should be able, under the right manager, to adapt their game to the opposition, Guardiola may have thought his style is the way to go, due to his past winnings, sadly the truth is the best teams are the ones that can consistently change player roles. Real Madrid possess players that can play multiple positions at ease. Benzema, is not purely a striker but can also be considered a #10 type, with Ozil gone as well as the abandoned 4-2-3-1 formation, he became more involved in the build up play. Gareth Bale, comfortable on either wing, can also track back to fit in a 4-4-2, Di Maria is perhaps the most flexible player Real Madrid can wish for, enough said. Ronaldo a winger, a striker, maybe not a defender, but a less selfish player than before, accepting his role no matter what, has become more flexible and a truly class act with his goals. Taking those four players into considerations and comparing them to Bayern’s attacking four (Ribery, Robben, Muller, and Mandzukic, I’ll leave the rest for you to decide. It is also worth mentioning that when Casillas is between those goal posts, the team influence are more upbeat knowing the Captain is there. This has to be Nueur’s worst performance in a long time… I was a little bit surprised. All in all, I don’t like to blame anyone, but Guardiola should consider a more direct approach of attacking style than his preferred possession ball only, we all have to remember that this ideology is part of his roots and will never change, perhaps Barcelona will come knocking on his door begging him to return to the only place his coaching will not be criticised by anyone. But for now, Real Madrid vs Atletico Madrid should provided a special derby in Lisbon (Bayern and Dortmund put a good show last year). Let’s hope it will be more thrilling! Quality points about flexibility and player roles, do team such as Real Madrid not fluidly change “shape” and swap roles during the run of play because of these multifaceted players? Isn’t that concept what modern football is about more than cliches such as tiki taka or parking the bus, possession or counter attack but reinvention and improvisation of old forms. Players retaining such talent across Europe should be able to play anywhere on the field, including a defensive mentality, only the right manager knows how to control and implement such ideology. Football will evolve but will always be the same game at the end of the day, it’s a matter of learning from previous teams that have succeeded and failed. Good point. He is also gifted with endurance. I have never seen anything like him before. The kid can run endlessly and not lose out to fatigue. I don’t think this type of endurance can come from training, it’s like some people are born with it. How do you run full speed for as long as he does with getting fatigue? It’s amazing. I have read the discussion below about the possession vs counterattack vs flexibility debate. While there have been some valid points, most people have omitted a very important factor. It’s called passion. There is a reason why there has never been a team to successfully defend it’s champions league title in the last 20+ years. Every single time a more success-hungry team shows up and defeats any opposition it faces, either possession or defense oriented. Just look at the last 2 years, which teams advanced in the CL finals. Dortmund and Bayern last year were truly committed and gave it their all in every single round. This year they have reasonably slumped. In their position comes a Real Madrid side rejuvenated by a new coach and going all in for the coveted Decima, and of course the fairytale of 2013-14 Atletico Madrid who face each and every match as a final. See, I don’t underestimate the importance of tactics or strategy, but after all in football it matters who WANTS to win it more. One of the most shocking results of all time. Amazing how the Bundesliga was being lauded at this time last year. Now Borussia Dortmund, albeit with impressive support, is little more than a feeder club for Bayern, as their 2 most impressive attacking players from last season’s campaign, Gotze, and Lewandowski will both be at Bayern next season. Gotze, a crucial figure at Dortmund, has been turned into a bit-part benchwarmer, by Guardiola, whose cerebral gamble to go to Germany now appears to be in the balance. Heart strings must be being pulled, as Barcelona need him. I don’t get it. Why does every great player in Germany want to go to Bayern. You’re at Dortmund, on such a great team, and you leave to go to Bayern to sit on the bench like Goetze? Maybe someone from Germany can enlighten me. Not a Bayern fan here but that’s easy to explain. Bayern is the only German club that can guarantee CL football every season and reasonably promise at least some success in the knockout stages. They can also offer significantly higher salaries. In fact, their financial power is much higher than that of any other German club’s, and with their stadium almost paid down, available financial means are only set to grow. Thus, expect Bayern to become an even more aggressive player on the German and international transfer markets. There may also be a a soft factor: Unless you’re rooted in the Ruhr area, Munich and its sourroundings are a much nicer place to live in. Am I the only one that really thinks this game needed gotze to start. He is a very creative player and he is the type that would get in between the lines of the mid and defense. Althoucan I think that muller should of started as well bc he usually is a big game player and shows up but didn’t this time. As good as bayern are and we’rekknown to be 2 weeks ago before this round. You have to realize that they have some crucial players getting up there in age. Robben, ribery, schwein, Dante. Main point I wanted to get people opinion on is what people think of gotze, he is a Barca style player to a point where he is very good with the ball at his feet, his movement, and can dribble. Madrid have trouble with some of those types of players at times and would of added something that they didn’t have on the field at the time… Let me know of what you guys think! Heynckes’ team would not have lost in this manner, is the least you could say. They may even have won the tie. Therefore, was guardiola a step forward or back for Bayern? Would man u have been a better choice for him, and then start a craze in English football of passing forward play? It does need some kind of revolution. Ancelotti’s main accomplishment here is probably getting Madrid good at attacking, when Mouriño was there Madrid were never thefull attacking force their players suggested they could be. Also, playing ronaldo, and bale and Di Maria (Wyn very similar players) in the sameteam, effectively, is as impressive as playing 4 playmakers at AC Milan in sirlo, seedorf, kaka and Rui Costa. Obviously there are some new pieces that cannot be overlooked (Goetze, Bale, etc. ), but with essentially the same core of players, Guardiola’s Bayern appears to have taken a step backward from Heynckes’, at least CL results-wise, while Ancelotti’s Madrid has taken a step forward from Mourinho’s. Come on, Bayern were even overrated last year. They were strong but the semi final was not representative, as Barca had huge problems and injured players like Messi Busquets etc. In the first half they offered only a Robben chance and needed to score by 2 corners. Bayern never really proved a point in this CL campaign. They struggeled against Arsenal and United, it was inevitable that they would get destroyed. what ? The first leg, Bayer vs Barca..
4 clear penalties for Bayern during a first half of the match, it looked like Ovrebo was refering again. Of course, Messi would have changed the game we saw that many times against Inter, Chelsea and others. He never changed any game only if a red card or penalties were gifted to Barcelona after diving. No penalty, no party. Let’s take off those Barca glasses. It’s Barca that are different this year. They are not the same team as they were 3-4 years ago. Last year’s Barca deservedly lost 0-7 to Bayern. Bayern were that much better than Barca last year. This year I think Bayern would win again, but perhaps not by the same margin. It’s amazing how it’s a “style” of football which is blamed if Barca (or a team managed by Pep) is blamed if they lose. Everyone will just look past the fact that Bayern simply played dreadful & just blame the “style”. There’s no other style of football which is blamed when it loses. If Bayern played to Pep’s standard, they simply wouldn’t have given the ball away to give Real Madrid a chance to counterattack. I more less stopped watching after 20 minutes because I realised straight away how the game would pan out because of how recklessly Bayern started/played. I think people are being simplistic. Pep doesn’t have the right players or time to play the tiki-taka that Barca employed during their peak. People think possession equates with tiki-taka but they are dead wrong. The reason why Barca’s tiki-taka was successful was due to not just almost total control of ball but more importantly their pressing and positioning which denies the opposition from using the ball to attack. In the early stage, Barca too were not as effective with tiki-taka but they evolved and refined it. Only when possession is allied with pressing and positioning, Barca became almost unbeatable. Another key to scoring goal is the tempo, which is kept high and the high level of running/fitness required to execute the system. Pep was lucky in the sense that he had players who were playing for years the same system and some really exceptional talents like Messi, Xavi and Iniesta. To make Bayern play tiki-taka in a true sense, it requires perhaps a few seasons. Bayern have improved their understanding of tiki-taka but they play in a slow manner of Bayern of Van Gaal days. I am sure if given time and addition of a few more suitable players would make Bayern a better/truer version of tiki-taka. However, the question is whether is it really necessary for Bayern to adopt tiki-taka or develop a hybrid system which combines tiki-taka with their own effective, direct style of play. I think Pep made a mistake here since I felt (and I though ZM thought so too) that Bayern’s system last year was a more flexible,entertaining and a progressive step for football. So in this sense, Pep’s Bayern regressed rather than progressed. As for RM, for all their counter-attacking assets and abilities, I thought Bayern nullified that and only one goal out of 4 came from open play. Even that goal was scruffy goal that perhaps Neuer should have saved. Bayern been predictable and any team with good defensive organization can nullify them and we have seen this season this happened many times – vs Chelsea, Man City, Arsenal, Man Utd and now RM. While I think Ancelotti is an excellent coach, I don’t think it takes a genius to figure out how to stop Bayern especially when you have counter attacking talents. I think it was Maurinho who came out with the idea of surrendering possession and play ong ball out of defence to beat tiki-taka. The other coaches are merely using the same template. MOANRINHO is out from CL so comments in Chelski v Atletico are closed so we cannot laugh at him. WE DEMAND JUSTICE!! !